ALIQUID: Recipes from the past six months! Recipes from the past six months! Hi all! Are we getting into the holiday spirit yet? My husband and I will be traveling soon, first to my in-laws and then my parents, so we're going to have a fun and busy couple of weeks! Today I decided to do some catching up with the food I've cooked for the last several months. I've gotten in the habit of posting pics on Instagram, but I've been bad about blogging. Almost all of these recipes were spur-of-the-moment decisions that I made with stuff already in my pantry. That's the best kind of recipe in my opinion! We happened to buy some blueberries one week back in June, and out of the blue I wondered "can I make a crisp with these?" The answer was yes, as long as you have some basic baking supplies around, like flour, brown sugar, butter and cinnamon. The whole process takes maybe half an hour. 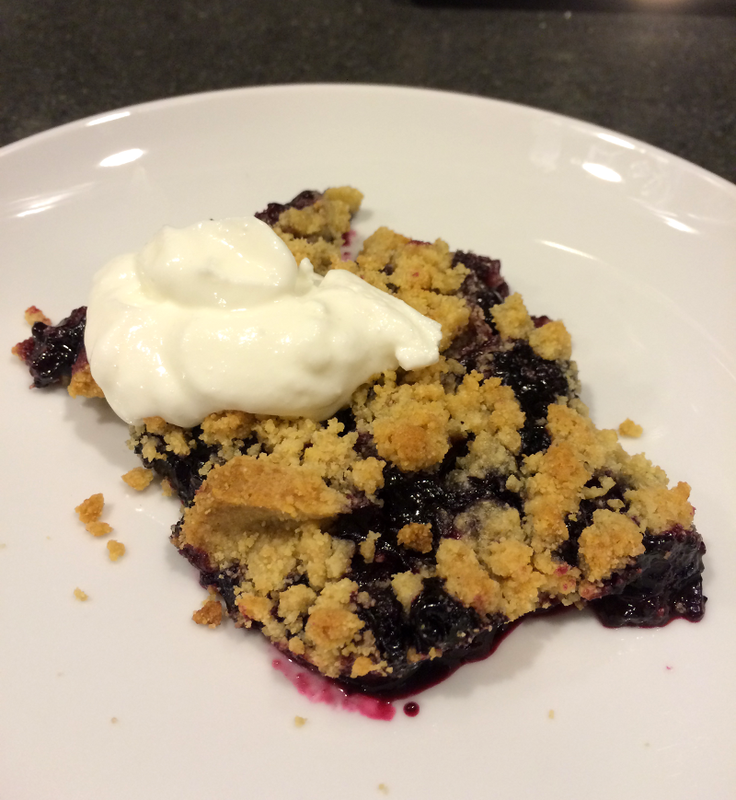 Unfortunately I don't remember what recipe I used, but I just Googled "blueberry crisp" and got a million very similar results. I was inspired to make these during a Good Eats marathon on Netflix. (Here is Alton Brown's recipe.) Ridiculously easy to make. 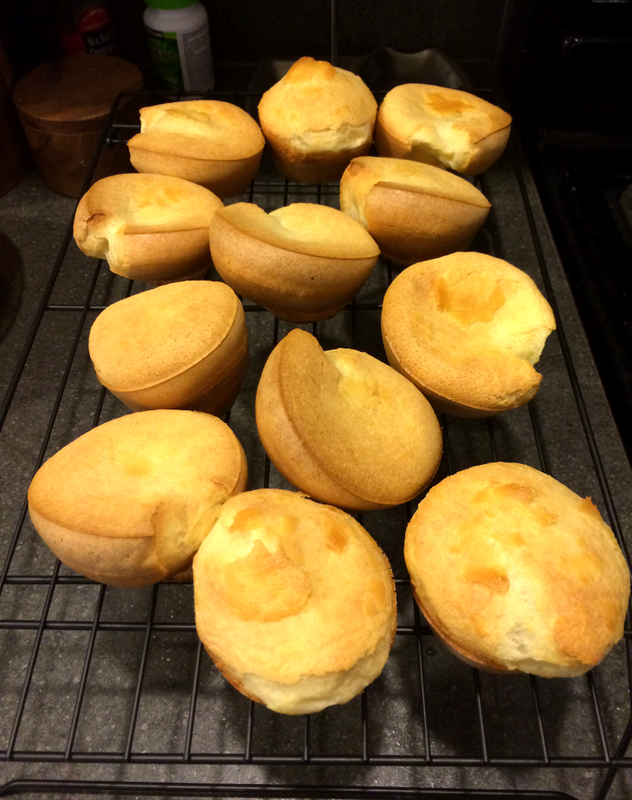 Mine are a little smaller than normal because I didn't have a popover pan, only a muffin pan. I think I just baked them for slightly less time than the recipe calls for. Another Alton Brown-inspired dish! (Recipe is here.) I used white onions instead of green, and it worked perfectly fine. Usually the only thing I can think to do with canned tuna is make tuna salad (and I make a pretty damn good tuna salad), so it was nice to learn how to do something else! 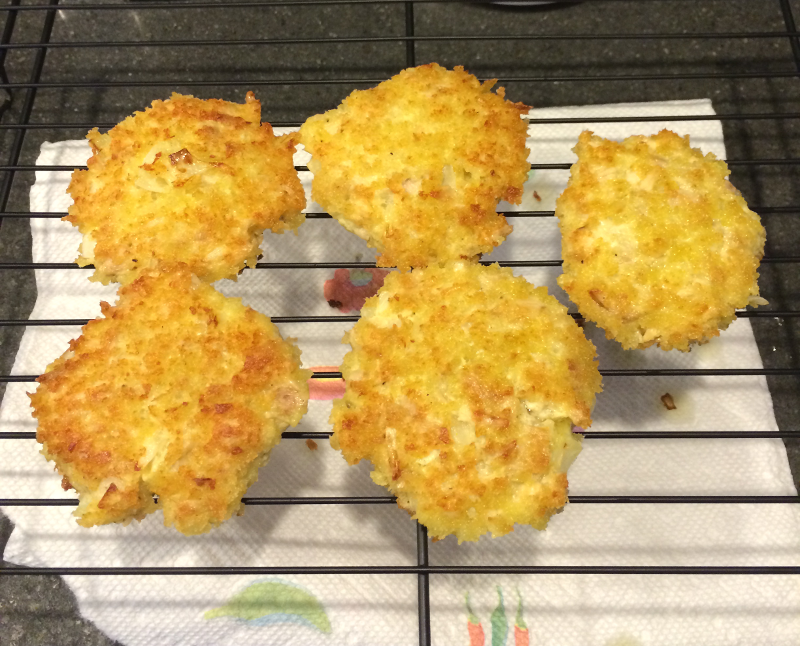 These get nice and crispy and golden-brown on the outside. They remind me of the salmon patties my mom used to make us. (Apologies for the ghetto cheese slices.) Cincinnati chili is something my dad would make for us occasionally after he came back from a business trip to Cincinnati. It has a lot of wintery spices like cinnamon, allspice and cloves, as well as chocolate! 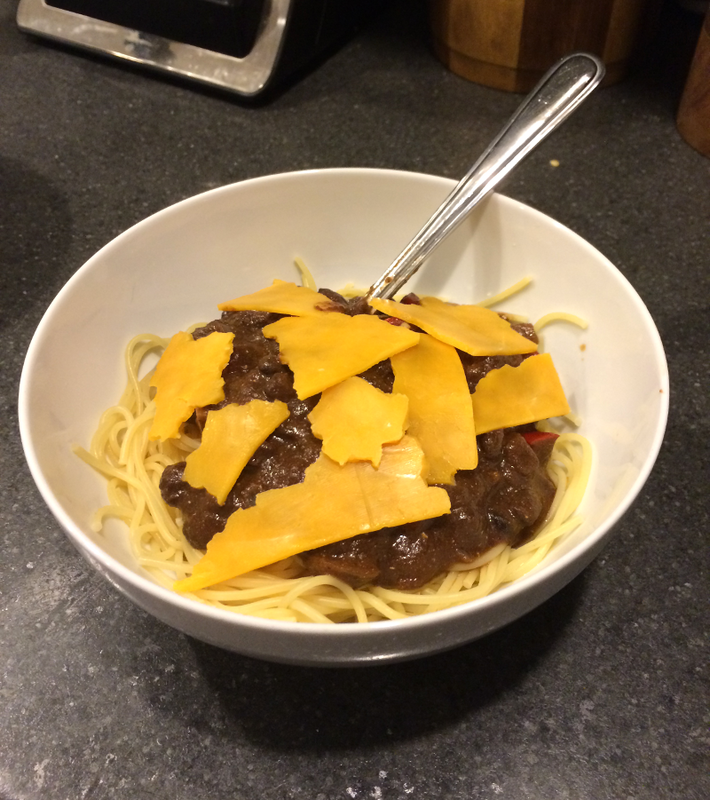 It's traditionally served over spaghetti with cheddar on top. (I used this recipe.) I replaced the beef with black beans because I had a can sitting around in the pantry. This Thanksgiving at the in-laws', everyone contributed something to dinner. My husband and I volunteered to do dressing (well, I always call it stuffing, but this was technically dressing!). We used a very simple recipe (here) because we had to keep it kosher and dairy-free. Also, his family doesn't normally eat dressing at Thanksgiving (what???) so we didn't want to overwhelm anyone! This photo is halfway through the cooking process, so it got all crispy and browned after this. 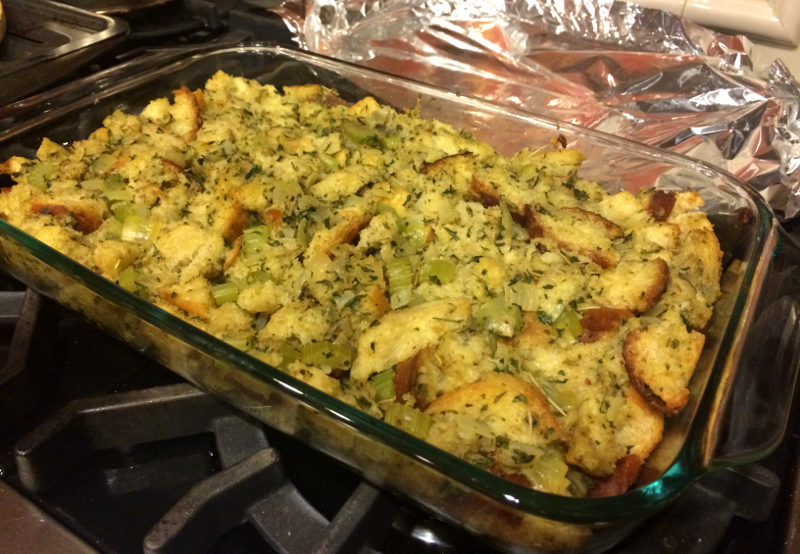 It tasted just how a traditional stuffing should taste, lovely and herbacious! Not Pictured: I made Martha Stewart's chocolate chip cookie recipe and they were AMAZING! Soft and chewy, just the way I like them! I don't know why I forgot to take pics! That's all for now! Have you cooked anything fun lately? I'll have to write another post all about the ice cream I've made this year! Yum! They all look delicious! Today's mani: Sideways ruffian for my birthday!